The Service Department has an in-house paving program. Responsibilities include pothole patching, berming, crack sealing, street cleaning and snow removal. In addition, the removal of minor street pads. All major street pads are contracted out. All street lighting is handled by Ohio Edison. If there is a problem that needs to be reported, please call 1-888-544-4877. 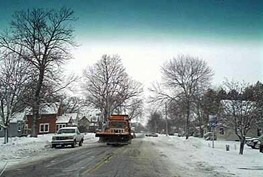 All curb streets will be swept at least twice a year. When there is a dead animal on the road, the Service Department will properly dispose of it. Street name signs and all traffic control signs are installed by the Service Department. The Police Department and Engineering Department are consulted on all traffic control signs. During times of snow that is two inches or greater, the parking on streets is forbidden. Please see ordinance 452.12. We currently have 18 trucks available for plowing the snow. All main routes will be plowed and salted. All school zones will be plowed and salted. All interior streets will be plowed and salted at the intersections, grades, curves, and main roads leading out of developments. *This policy may be changed at the discretion of the foremen at any time.